Favorite family memories include our Switzerland Vacations! Travel in this gorgeous country is very efficient and so it makes for a fantastic family vacation getaway. It is also a great destination for romantic getaways....a chance to slow down and be refreshed. 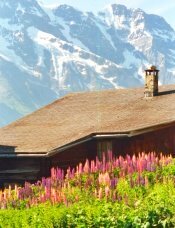 The awesome beauty of the Swiss Alps.....especially in the Bernese Oberland and Jungfrau Region cannot be beat. Lauterbrunnen and Murren are my favorite places to stay for Switzerland Holidays. This website will cover these favorites and more, including many pictures of Switzerland, places to visit, attractions, Swiss Hikes and more. If you are looking for discount airfare to Switzerland, you can Find Cheap Flights from 100+ Sites with One Click . This mega search engine lets you compare and find the lowest airfare. Switzerland is the perfect place to travel by train which is clean, efficient and on time.....to the second. The Swiss Rail Pass or Swiss Pass is a great option available only to those who live outside of the country. It has to be purchased ahead of time. It is good for the trains, boats and buses for either 4, 8, 15 or 22 days and will get you almost anywhere in Switzerland. If you decide not to use Swiss Rail, check out Cheap Rental Cars to find out the best price for a Car Rental in Switzerland. If you are looking for Bernese Oberland Hotels, check out Kayak which searches 120+ websites for the cheapest hotel prices. There are also many Switzerland Apartments which are perfect for a family vacation getaway and longer Swiss holidays. If you prefer a busier town and want to be able to take longer day trips on Swiss Rail consider Interlachen. Lauterbrunnen has an awesome setting in the narrow Lauterbrunnen Valley. The town is surrounded by steep limestone cliffs and a fantastic waterfall! This is my favorite base for taking the many side trips in the Jungrau Region. The views in this car-less village are spectacular. "Center stage" are the awewome peaks of the Eiger, Monch and Jungfrau. This car-less village has a fancy, Swiss Mountain Resort feel. Wengen is set on a narrow, sunny plateau above Lauterbrunnen. There are plenty of shops, hotels and restaurants. Do you have a favorite town, hotel or attraction that everyone should know about? When you return from your Swiss getaway, tell us about it. Review the destination, lodging, attractions, restaurants and/or share a photo. I hope you enjoy exploring this beautiful country and these favorite destinations!